The View from SF: Bernal Heights is Back! 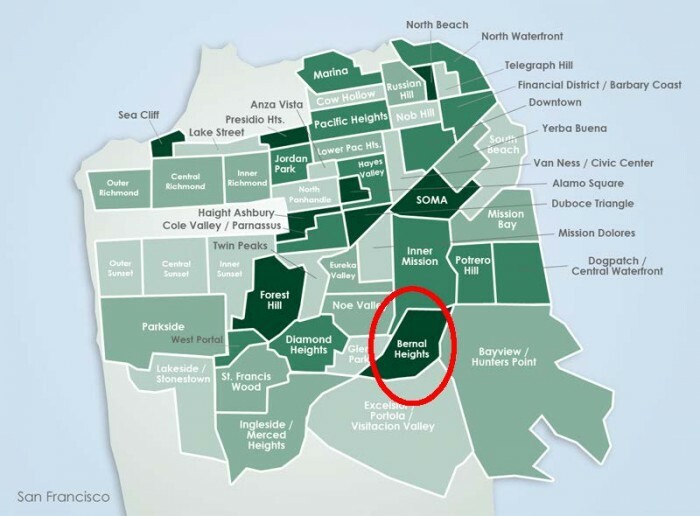 The burgeoning boomlet in well-priced real estate is being felt in every San Francisco neighborhood, but one little locale in particular has been enjoying some robust activity. Bernal Heights, a quaint, sunny little neighborhood situated atop a steep hill at the southern edge of the Mission District, is characterized by a throwback feel. Small markets and cafes share space with fruit stands, barber shops, and community gardens, lending this area the feel of a quiet country village set in the middle of the big city. The area’s offbeat feel and bohemian charms attract artists and progressives; it’s also a favorite for young families and dog owners, thanks to a plethora of single-family homes with yards. Grassy Precita Park has a great playground, and nearby Bernal Heights Park boasts an off-leash dog area and impressive city views. Also impressive has be en the recent real estate activity. We have been seeing homes getting multiple offers, with several going well above asking. For example, a three-bedroom, three-bath home recently came on the market at $1,195,000 and sold for $1,440,000 a scant 11 days later. It’s a dramatic change from last year. Inventory is still light, but the demand is high. And based on the competition for available homes that we’re seeing, we’d say it’s gaining strength. Market conditions indicate that in the past three months, sales prices are significantly up (the average today is $720,960) while the number of properties listed in Bernal Heights is sharply down, as is the number of days on the market — supply and demand in action. If you’re thinking about buying a new home, it’s worth checking out this hidden gem in San Francisco. And if you’re thinking of selling a Bernal Heights home, you’ll likely find a warm reception.